Make your own mini artwork inspired by Monet, Matisse and other modern masters in this vibrant mass workshop that explores the colours, lines and shapes of modernism in a variety of materials. All experience levels are welcome and all materials are provided. We’ll provide the materials and advice, so grab a drink, listen to the music and get creating! Picasso was one of the founders of collage in 1912, which opened up a whole new set of possibilities for artists to use found materials. 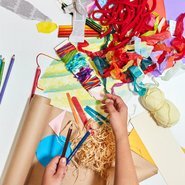 Using still-life as your inspiration, create your own cubist collage using different papers and fabrics. All experience levels are welcome and all materials are provided. In the 1910’s and 20’s, Sonia Delaunay created vibrant coloured artworks in a range of media, including textiles, watercolours and interior design. Create your own textile work inspired by Sonia Delaunay’s patterns. Thread fabric through paper or weave your creation. Matisse is widely known for his use of vivid colour, and his fantastical landscapes. Create a bright and joyful imagined landscape of your own, using different collage techniques, just as Matisse did himself.